Here is a sample of some of the sites we've done. In some cases, we did the complete design. In other cases, we took a design from a design or marketing firm and implemented that design. Please feel free to browse our work, read the case studies, and let us know if you have any questions. 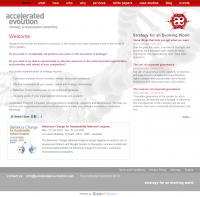 A sophisticated, C-suite-level organisational transformation consulting firm went from a hard-coded-HTML-based site that really didn't reflect their brand and was hard to manage and update to a full content-management-based website where consultants could contribute content easily, keeping the site alive and up-to-date, with a look that better aligned to the company's branding and culture. 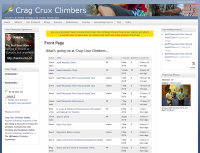 A multi-featured community website for rock climbers and outdoor enthusiasts, ClimbingPartner.net boasts a very detailed profile, which is searchable across the entire site, as well as private messages, articles and media content. 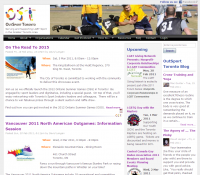 An amateur athletic association had a couple of static web pages, and used Yahoo! groups to manage communications, with Yahoo! branding and advertisements instead of their own. Not they have a fully featured community site, with more features than they did before, and branded with their own logos, slogans, and other material. 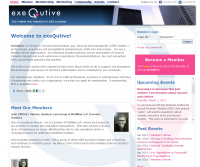 Founded in 2007, exeQutive didn't have a web presence three years later. Today, exeQutive.ca reflects the organisation's branding, is the on-line brochure for the organisation, and offers members enhanced networking capabilities through comprehensive professional profiles, events listings, eVite-like invitations and RSVPs to events, and more! A corporate website went from outdated, flash-based, and static to a dynamic, content-management-based system with company staff now in control of their website. An entrepreneur needed to get her name and her product "out there". She had a domain name, but nothing else. Using one of many open-source themes, we were able to get her site up quickly, modifying it slightly for her needs and branding, and providing her the ability to manage her on-line presence herself. A brand-new umbrella amateur athletic association needed a web presence to not only make itself known, but to act as a communication hub for member organisations. A talented designer and draftsman was looking for a way to show prospective clients what he could do. He wanted to point them to a place on-line. He knew he needed a website that not only had samples of his work, but also reflected good design sense. A company with excellent technology important to the privacy of all Canadians needed to get its message on-line. An initial static website was up and running for a while, but now it was time to move to the next level.